When PLC staff asked residents of Zawita camp in Dohuk what business skills they had, people responded that they wanted to raise chickens again. In response, within the week PLC and Partners Relief and Development delivered 500 chickens to 45 displaced families there. This should be the beginning of larger flocks as well as a sustainable source of protein. Here, PLC also assessed camp water needs. Her steps crunch on the gravel path as she walks from her tent, down through the camp to the main gate. She carries an empty water bottle—it makes a soft, hollow thud against her leg as she walks. At the camp gates, she goes to the big, galvanized water tank, and carefully pours a gallon of clean water into her bottle, then makes the return trip home. The thin, blue plastic handle cuts into her hand from the weight of the water, so she walks more slowly now, shifting the bottle from her right hand to her left, and back again. She has lots of time to think as she walks—time to think about what was lost to ISIS, and what her life on her farm used to be like. She greets her neighbours as she passes: Muslims, Yazidis, and Assyrian Christians. Just a few years ago she couldn’t have imagine any of this, but somehow they now eke out a life together. Zawita Camp isn’t a sanctioned camp established by an NGO agency. It’s a rough collection of tents, abandoned houses and half-built utility buildings topped with nylon tarps, that grew organically because of profound need. 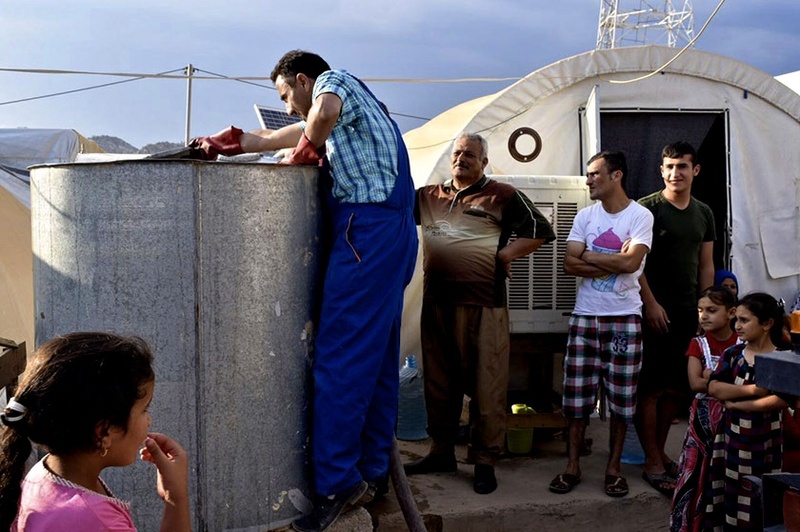 Not everyone who fled ISIS in Iraq landed in tidy, sponsored camps. Because it’s not a sanctioned camp, Zawita doesn’t receive the funding or services that sanctioned camps get. 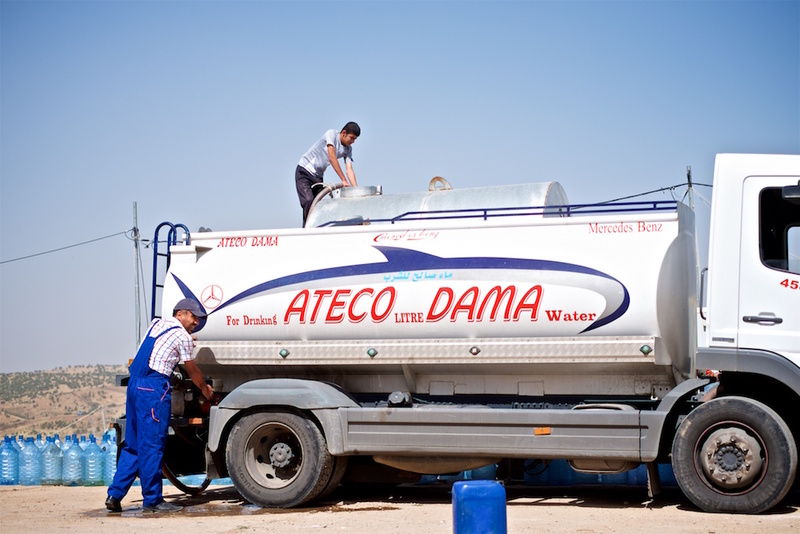 The camp is not serviced by municipal water, so the government trucks potable water to a large tank at the main camp gates each day. 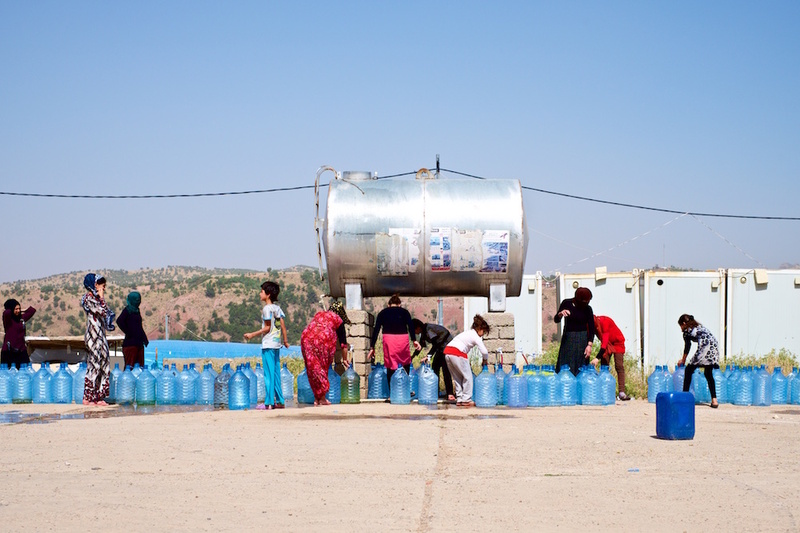 The water provided is not enough for families though—just 1 gallon per person, per day. Women spent their days filling water bottles at the main gates, then walking back to their home in the camp—and this was repeated over and over on behalf of each family member until the water was gone. When we met the residents of the camp, we spent time listening to their needs. They asked for more water, and described how it would make a significant difference to their quality of life if they didn’t have to haul it from the front gates. 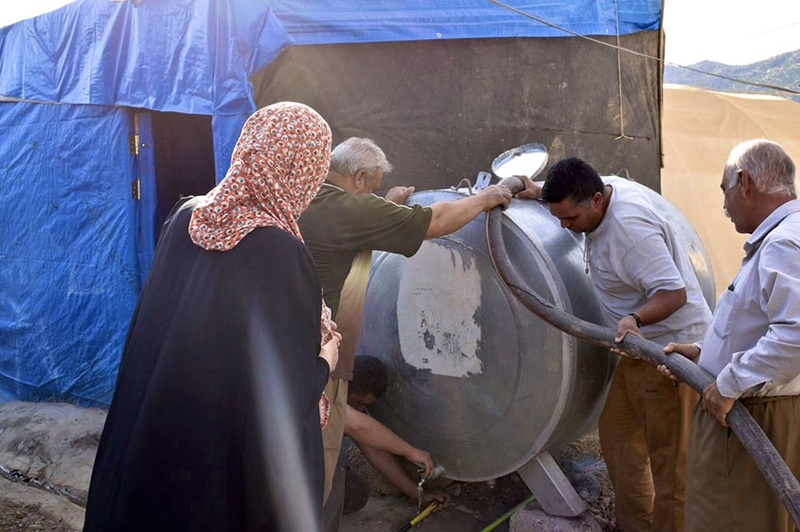 If a water truck could put potable into their own water tanks each day, the women of the camp would no longer need to spend their days hauling water from the main gate, and would have more time to care for their families. Less transferring of water from smaller bottles would help to keep the water cleaner. Access to more water would help to prevent dehydration in the heat of the summer, and would mean families didn’t have to choose between having water to drink or having water to wash.
Today, because of you, 47 families have enough water to live more comfortably. 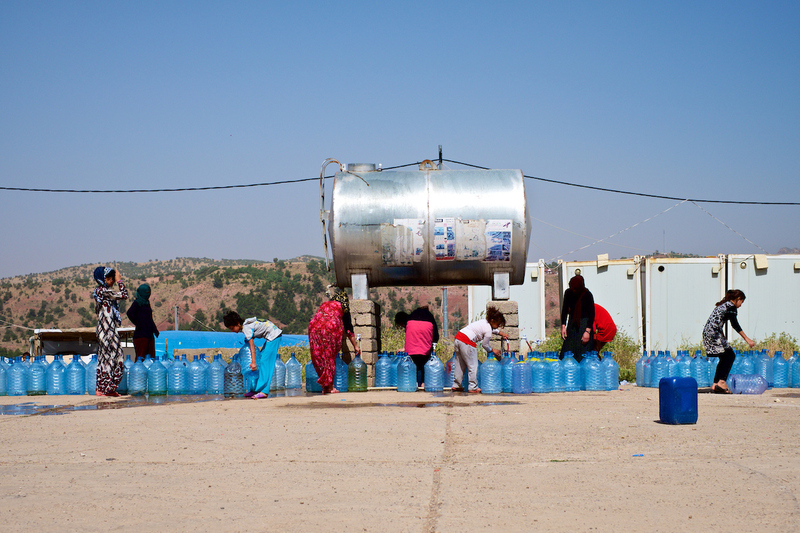 Water is being delivered to each home in the camp daily through to September, and this community no longer feels forgotten. Our conversations at the camp—long, trust-building sessions of listening over countless cups of tea—have extended into conversations about small business Empowerment projects. 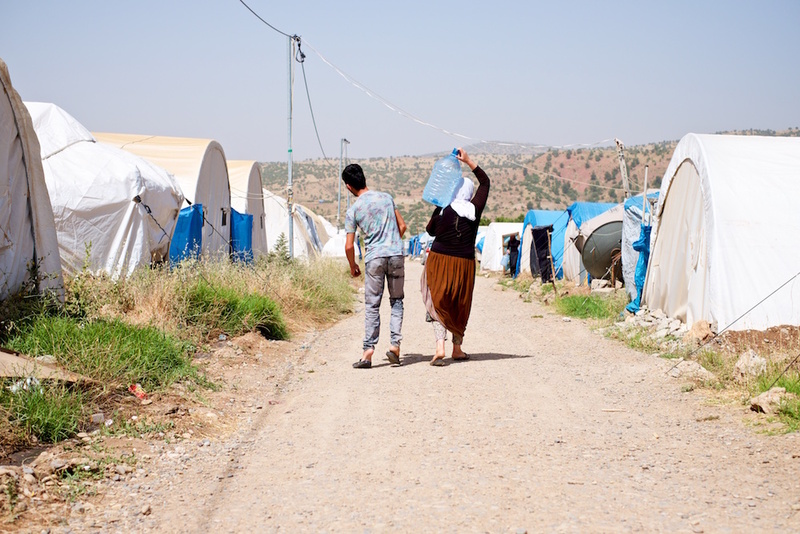 We have some exciting stories to bring you from this rag-tag camp in Northern Iraq!